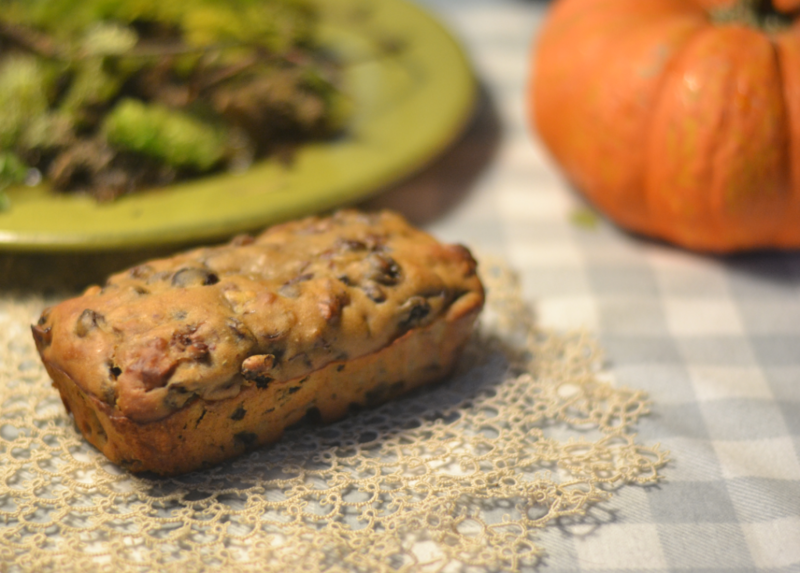 Ireland’s culinary tradition includes the baking of tea brack in the autumn, around Halloween time. ‘Brack’ meaning ‘speckled’, most versions of the bread include some combination of dark raisins, sultanas, mixed peel or currants. Tea brack usually refers to a quick bread leavened with baking soda or baking powder, while Barm brack is a yeast-raised loaf, one of the few yeast recipes in the Irish farm kitchen repertoire. The night before baking, place in a large bowl: 1/2 cup dark or golden raisins (dark will absorb the liquid better), 3/4 cup craisins (dried cranberries), 1/4 cup brown sugar, and the grated rind and juice of 1/2 lemon. Brew a pot of Lyons Tea (OK, you can substitute another black tea but it won’t be the same). When you have a strong tea, pour 1 cup of it over the fruit, mix well, cover and let sit overnight (doesn’t need refrigeration). On no account should milk be added to the tea! Next day, chop shelled walnuts to equal 1 cup, and add to the fruit mixture. Beat 1 egg and mix well into the fruit. Set the oven to 375 degrees F.
Sift together 1 1/4 cups AP flour (bread flour is too heavy), plus 1 teaspoon baking powder, a pinch of salt, 1 teaspoon cinnamon, and 1/2 teaspoon nutmeg. Gradually add the flour mix to the fruit, stirring carefully – don’t overbeat. Add a little extra flour until you have a cake-batter-like substance that’s a bit runny. STOP adding flour before it turns into a dry dough. What you have may remind you of Aunt Mildred’s dreaded fruitcake, but trust me, the result will be different, more like crack. Melt 1 teaspoon butter and brush the inside of a loaf pan, round cake tin or 2 mini-loaf pans generously with butter. Cut parchment or wax paper to fit the inside bottom of the pan. Pour in the batter and even it out on top. Pop bread onto the middle rack of the 375 oven for 10 minutes, then lower heat to 325 for 20 minutes or more. When a toothpick or skewer inserted into the bread comes out clean, it’s done. Depending on the depth of the loaf, it can take up to 50 minutes to bake. If it browns too quickly, cover with a foil tent. Cool in the pan for 10 minutes, then knock the loaf out of the pan and let cool completely. Resist the urge to inhale the entire loaf at once. Really best if hidden away for a day. To serve, toast bread slices lightly and serve with Kerrygold Irish butter and a large pot of Lyons Tea. Keeps about 3 days and can be frozen. Read about the difference between raisins, sultanas and currants.